Back in September, Amanda covered the Abaco Jamily Metallic Python Crossbody bag. The only thing she said could lead her to loving this bag more was if it were finished in gunmetal. LOOK AMANDA! They did it. Just for you. Amanda asks, and Abaco answers. Right now I am finding myself in a bag lull. The ladylike minimalistic bags are great, but it is a little dull to continuously cover. In all reality, this bag stopped me quickly when doing my usual perusing of online shops. I am on the biggest crossbody kick right now, finding it so entirely helpful when walking around the City to have both hands free. 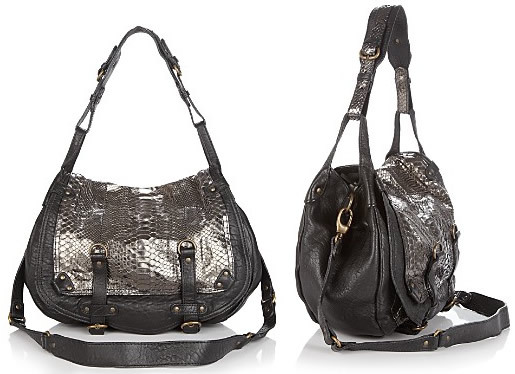 And the design of the Abaco Jamily Metallic Python Crossbody Bag is something both Amanda and I love. It is a mixture of practical and hip. I have not seen this bag in person, but am determined to track it down and try it out. It is refreshing to see a lesser known brand give a reasonable price to their bag. The look of the bag is great, I just hope the quality is as well. The gunmetal metallic python if offset with darker pebbled leather. The inside is functional, a zip and cell phone pocket. Overall dimensions are 13.5″W x 11″H x 4.25″D while the hand and shoulder drops are 8.5″ drop and 18.5″ drop. Buy via Bloomingdale’s for $1,225.